The Flame Angelfish, Centropyge loricula, is one of the most popular dwarf angelfish species. All you have to do is see one single specimen to realize why they are so popular. These fish get their name Flame angel from their striking fiery red bodies with an orange center, just like a fire core. They display vertical black bars on the sides and deep blue back fin ends. Although hardy, they still need clean and stable water in order to stay healthy. Their average lifespan is between 5 – 7 years, but there have been some specimens that lived even longer. All Flame Angels are born female. In the wild, the alpha fish changes gender to male while the rest of the harem remain female. Are flame angels reef safe? Flame angelfish can reach up to 6 inches long, with males being slightly larger than females. In the wild, these fish can be found in stony coral reefs scattered throughout most tropical areas in the West Pacific, from the Great Barrier Reef and the Pitcairn Islands, around the Marquesas, and Hawaiian islands and all the way to Belau. Centropyge loricula are perpetual motion machines, swimming almost non-stop and picking at the rocks for tiny morsels of food as they go. There is no consensus, online, with respect to what the minimum tank size should be to keep this fish. Some sites report 45 gallons, some report 70 gallons. I will share with you my perspective, on the matter. This fish swims around the tank…a lot. It seems to never stop swimming. It swims and nibbles on rocks and the aquarium glass pretty much, all day long. But keep in mind, the fish is also rather small, in most instances. I’ve personally had some success raising this fish in a 70-gallon tank, so my recommendation is somewhere in between–a 55-gallon tank feels like the right size, from my perspective. The 48-inch length should give this fish a nice territory to zip around in. Flame Angelfish are omnivores and benefit from a diet that includes both meaty and vegetative foods. Some frozen foods even have foods optimized for dwarf angelfish. Some foods to consider are brine shrimp, mysis shrimp, spirulina, marine flakes or pellets and even sheets of nori. Live rock will be grazed on in between meals. A newly introduced flame angel may be shy at first, but if provided with enough structure, it will adapt quickly to their new environment and become an active, bold swimmer. Most Flame Angels are considered to be reef safe, but there is always a risk with every angelfish species that they may nibble soft fleshy polyps or clam mantles—so buyer beware. Centropyge loricula generally get along well with other similarly-sized non-angelfish species, but should not be kept in a tank with other angelfish except by advanced aquarium owners with large tanks and a desire to observe their pairing behavior or attempt breeding these fish. This is not an easy endeavor, and you should expect extreme aggression. While the Flame Angel is a dwarf angel and therefore relatively small in size, they are active swimmers and would benefit from being kept in a tank sized 55 gallons or larger. Starter fish -Highlighted in that last article is the coral beauty angelfish, which would be an alternative to the flame angel–not compatible with it. It is easy to fall in love with this beauty, but is the flame angel reef safe? That’s one of the most common (and important) questions. The answer? Well, the answer is yes, they are generally considered to be reef safe, but…it depends. While individuals from this dwarf angelfish species generally leave corals alone, certain individuals may become polyp nippers. They won’t likely eat all of your prized coral polyps, but they may nip and harass a little. Most of us reefers would be willing to take that risk, given how gorgeous they really are, but if you are concerned that they might try to eat some of your prized soft coral polyps, you might want to steer clear of angelfish altogether. 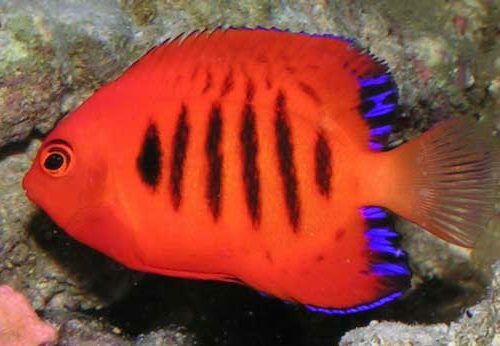 Many of those who have attempted breeding Centropyge loricula in captivity stated that it pretty difficult and the young are hard to rear, but with recent advancements in the breeding of saltwater fish, I suspect that aquaculture flame angelfish will be available within a few years. There have been successful attempts but nothing stable. Flame angelfish spawn in the same manner as other dwarf angelfish species, by releasing sperm and eggs at the same time at sunset. The larvae drift among the plankton until they settle out. The Flame Angel may also bee found in fish stores under one of these other common names: Dwarf Flame Angel or Japanese pygmy angelfish. In my experience, the price of the flame angel is relatively high and can vary significantly, based on where you purchase it. At the time of this article, the fish is priced between $60 and $90 across a few different online retailers. I have been fortunate to have cared for this species in my tank on three occasions. While I gave a disclaimer earlier that these fishes might develop a taste for soft coral polyps, I never noticed any issues with mine. At least one of the fish I had seemed extremely susceptible to marine ich, and died due to complications from an infestation–which is totally my fault, not his/her. Otherwise, Centropyge loricula was a delightful species to have in my tank. Extremely bright, bold coloration and active swimming made it a tank favorite among almost anyone who saw it. 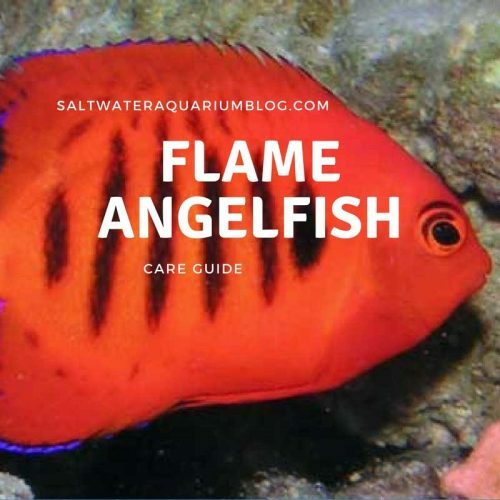 If you take just one look at the flame angel it will become obvious why these are such a popular (and expensive) saltwater fish species. What has your experience been with them? I always wanted one, but my tank is only 46 Gallons. Darn! I purchased one yesterday. It’s beautiful. It’s being bullied by the Coral Beauty but hopefully they sort themselves out. Erin, thanks for the post. They are beautiful but typically it is challenging to mix angelfish!!! Hope yours get a long.